When shooting with the Nikon D7100, this setting determines the resolution, or frame size, of your movie, as well as the number of frames per second (fps), both of which affect video quality. You can access this setting via the Movie Settings option on the Shooting menu or through the control strip. If you travel by way of the menu, you’re presented with the options shown i. If you access the setting via the control strip, the options appear superimposed over the live scene, but the available settings are the same. If you’re a digital video expert, these options probably make perfect sense to you; take your pick and move on. If you’re new to video, here is some background that will help you understand this numerical soup. The first thing you need to know is that which Frame Size/Frame Rate options are available depends on the Image Area setting. At the default setting, DX, the camera uses the maximum area of the image sensor to record the image or, in this case, your 16:9 video. The other Image Area option, 1.3x crop, uses a smaller area at the center of the sensor. For movie recording, you can access the first two Frame Size/Frame Rate options only when using the 1.3x crop setting; otherwise, they’re dimmed. Frame size: Frame size refers to the number of pixels used to create the movie frame. In the world of HDTV, a frame size of 1920 x 1080 pixels is considered Full HD — meaning the best possible (at the moment, anyway) — whereas 1280 x 720 is known as Standard HD. The default setting is 1920 x 1080. Frame rate (fps): This value, stated as frames per second (fps), determines the smoothness of the playback. Available frame rates range from 24 to 60 frames per second. 24 fps is the standard for motion pictures. It gives your videos a softer, more movie-like look. 25 fps gives your videos a slightly sharper, more “realistic” look. This frame rate is the standard for television broadcast in countries that follow the PAL video-signal standard, such as some European countries. If you bought your camera in a PAL part of the world, this setting should be the default. 30 fps produces an even crisper picture than 25 fps. This frame rate is the broadcast video standard for the United States and other countries that use the NTSC signal standard. It’s the default setting for cameras bought in those countries, too. 50 and 60 fps are often used for recording high-speed action and creating slow-motion footage. With more frames per second, fast movements are rendered more smoothly, especially if you slow down the movie playback for a slo-mo review of the action. How about 50 versus 60? You’re back to the PAL versus NTSC question: 50 fps is a PAL standard, and 60 is an NTSC standard. P (progressive) versus i (interlaced) video: Finally, the top two options on the list of Frame Size/Frame Rate settings end with the letter i, but the rest are tagged with a p. The initials stand for interlaced and progressive, which refer to two different ways to record the lines of pixels that create a frame of digital video. With interlaced video, a single frame is split into odd and even fields, or lines of pixels. The data from the odd lines is recorded first, followed rapidly by the data from the even lines — so rapidly, in fact, that the picture appears seamless during playback. With the second technology, progressive video, all the lines are pulled out of the magic video hat in sequential order, in a single pass. Progressive is the newer technology and tends to deliver smoother, cleaner footage when you’re shooting fast motion or panning the camera. But your HDTV should be able to play both types of video. Also, if you plan to combine footage you shoot with your D7100 with existing interlaced footage, it’s best to use the interlaced setting so that all your video clips use the same technology. *1920 x 1080; 60i: Full HD using 60 interlaced fields to generate a final frame rate of 30 fps. (Remember, an interlaced frame is created by two passes, so your 60 fields combine to produce the 30 fps rate.) You can’t choose this option when the Image Area option is set to DX; you must use the 1.3x crop setting. *1920 x 1080; 30p: Full HD at 30 fps, using progressive video. 1920 x 1080; 24p: Full HD at the movie-like 24 fps progressive video. 1280 x 720; 60p: Standard HD with a frame size of 1280 x 720, a frame rate of 60 frames per second, and progressive video. For videos that follow the PAL standard, instead select a frame rate of 25, 24, or 50. 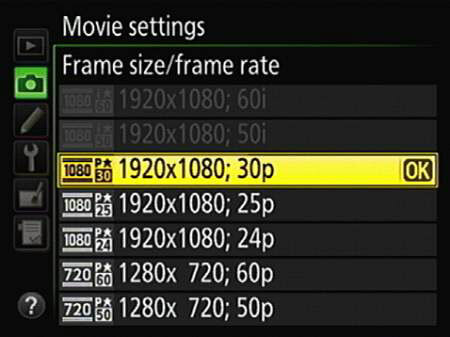 Again, the 1920 x 1080; 50i setting is available only when you use the 1.3x crop setting for the Image Area option. One more note before you head out to simpler pastures: See the little symbols appearing to the left of each setting? They’re simply (yeah, right, “simply”) a reminder of what you see on the Live View screen to indicate each setting. The first number specifies the vertical pixel count of the Frame Size; the p or i indicates progressive or interlaced, and the other number tells you the frame rate. Oh, that little star? It means that you selected High as the Movie Quality option. No star means that option is set to Normal.